On the last episode of The Florida Bar Podcast, Adriana Linares discussed lawyers and technology with President Ray Abadin. But what are the overarching goals of The Florida Bar going into the future, and how do presidents, president-elects, and other leaders within the bar work together to maintain focus and achieve these goals? 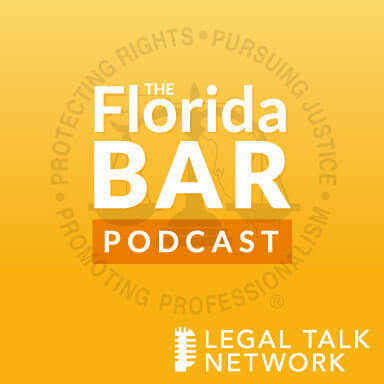 In this episode of The Florida Bar Podcast, Adriana Linares and co-host Renee Thompson interview President-Elect Bill Schifino at the 2015 Voluntary Bar Leaders Conference about overreaching themes in the bar’s five-year future plan and the nature of bar succession. Tune in to hear Schifino’s thoughts about his term as president, what’s on the horizon for the legal profession, and themes such as judicial branch independence, lawyers’ public image, access to justice, enhanced member benefits, and diversity within bar leadership and the profession as a whole. Bill Schifino is a commercial litigator and managing partner of Burr & Forman in Tampa, Florida. He was elected president of the Florida Bar in 2015, and will serve as president starting in 2016. Schifino has been on the bar’s board of governors since 2008.